Welcome to the High Definition Dance weekender! The first CAMPING dance festival EVER to explode into London and Essex with PHAT bass, PUMPING tunes and a COOL collaboration of dance acts old and new. Plus an adrenaline fueled funfair and not forgetting CAMPING for 3000 people! 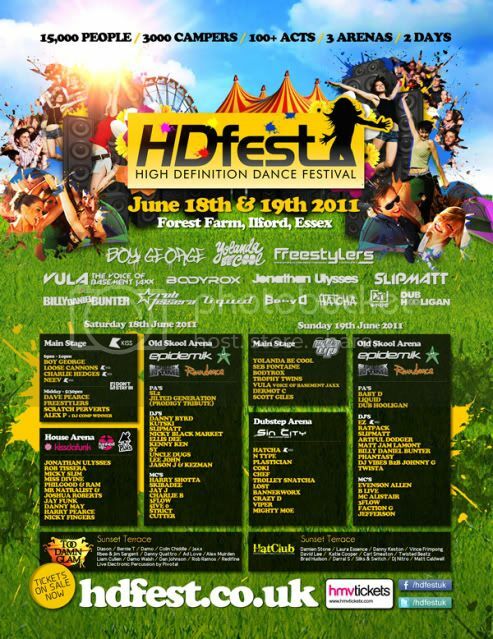 HD Fest has partnered up with Kiss FM, Dontstayin.com, Pukka Up, Epidemik, Raindance, Slip Back In Time, Kissdafunk, Pams House, Funked Up, Too Dam Glam, Sin City, Hat Club and Mixcloud to bring you the cream of the crop of dance sensations. HD Fest is providing a vast genre of dance music to please everyone’s tantalising tastes. With Trance, House, Old Skool, Garage, Drum & Bass and Dubstep. All this just a stones throw from Fairlop Central Line Station! Campsite opens at 3:00pm Friday 17th June and remains alive and kicking until noon Monday 20th June for the most hard-core party people! HD Fest is providing a free shuttle bus to transport campers from the nearby offsite car park to the festival venue and campsite. The campsite is conveniently placed a 1 minute walk away from the main dance stages and the all-important bars. The campsite offers all the latest amenities in Festival Camping. Fantastic! Fairlop station is just next door and is accessed via the Central line on the London Tube (Red Line). The central line can be accessed via Liverpool Street and Stratford overground stations, for full details visit National Rail Enquiries - Official source for UK train times and timetables to plan your journey. Earlybirds are £30 per day or £80 including Friday to Sunday night included camping. Booking fees apply on all booking sites. Standard tickets are £40 per day and will be £100 for the 3 nights campaign included. Booking fees apply on all booking sites. HD festival tickets are selling like hot cakes and we advise that you get all your friends in on the action and grab some tickets so you don't miss out! Camping tickets are flying out! Remember these are limited and once sold no extras available! Well look no further, on site will be our fun fair with the 'thrill factor' drummed into its roots. With rides pulling 3.6G force and 65mph were sure to find the screamer in you! NOW GET IN QUICK AND GET YOUR FESTIVAL TICKETS! We thought you might like a little taster of Rob Tissera (Kissdafunk) in the run up to him playing at HD Fest. Rob has a new mix up on Mixcloud here so get your ears around it and book your ticket soon! With just 3 weeks till the gates open fantazia have joined to heavyweight Old Skool Arena for HDFEST forming the biggest collaboration of the most respected Old Skool Brands in the country ever to be brought under 1 roof!!! Campsite opens at 3pm with entertainment from 7pm. Friday will be the opening of HDFEST’s Comedy Show. Raw stand up comics will get the festival feeling started with the bars open until 11pm. This is strictly for camping ticket holders only.